The name portable air conditioner suggests that they are cooling systems, which can be ported or moved from one place to the other with ease. Due to this particular feature, portable air conditioners are preferred both by renters and house owners. In fact, portable air conditioners can be a great choice for office environments as well. However, some are of the opinion that it is a far better idea to buy a window air conditioner instead of a portable air conditioner. In order to find out the best deal with regards to the purchase of portable air conditioner or window air conditioner, we will have to go through the features of both these cooling units. 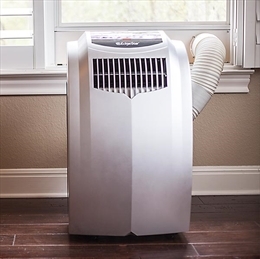 Portable air conditioners are movable units and they have exhaust hoses that are quite easy to install and can be vented out through a variety of window types. On the other hand window air conditioners are less expensive when compared to the portable units but the installation of window air conditioners involves complexity and they fit only in standard size windows. 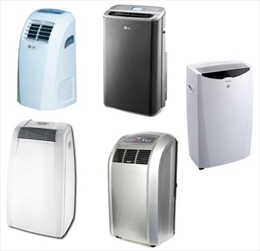 When the prices of portable and window air conditioners are compared it is seen that a portable air conditioner of the same cooling capacity to that of the window air conditioner is more expensive than that of a window air conditioner. In case of a window air conditioner, higher the cooling capacity more is the price. Window air conditioners are known to save floor space unlike the portable air conditioners. The portable air conditioners might be compact units but they will be standing on the floor area taking up walking space, while the window air conditioners will be stored entirely outside the living space of a house. Another advantage of portable air conditioner is that the rooms which are hotter than the others can be cooled on demand while in case of window air conditioners only the room where the unit has been installed can be cooled. The noise factor in case of window air conditioners is more than that of portable air conditioners. However, it must be noted here that some of the portable air conditioners could be a little noisier than the others, while some of them can be as quiet as fans. In case of portable air conditioners it is difficult to find out the Energy Efficiency while in case of window air conditioners there are Energy Star Ratings that help in determining the energy efficiency of the window air conditioners. Thus, while buying window air conditioner you can be quite sure about its efficiency. Portable ACs unlike window ACs requires constant draining of the excess moisture which could be quite irritating. On the other hand, in case of window air conditioner, the moisture drains out through the drain pipe and do not need any extra effort. However, it can be concluded saying that before buying a portable AC or a window air conditioner, advice from an HVAC expert must be taken so that the right kind of unit is installed in a home based on the individual requirement.